The looking outward that I chose to respond to was Selina Lee’s week 5 post. 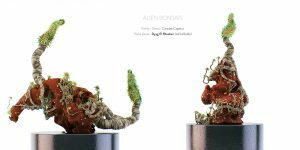 The project that she cited was Alien Bonsais, and was made by Chaotic Atmospheres. 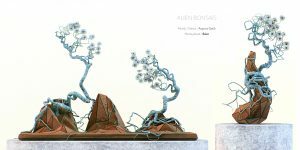 I thought the 3D modeled plants looked beautiful. The artist did an amazing job of making them look as if they were from another world. In addition, I would have to complement Chaotic on his/her choice of color for the plants. Each model has a small amount of a bright color to make the images pop. One critique of Chaotic’s work that I would have is the background that they used. They used a plain white back drop, and I though it would have looked more interesting in a surrounding environment. I chose to look at Jihee Kim’s Looking Outwards focused on randomness. She talks about a collaboration project between visual artists Memo Akten and Quayola. i agree with Jihee in that the project looks at the motions of the human body as it performs, in this case, extreme physical movements. I, however, don’t see the link of the randomness to the forces exerted on or by the human, as Jihee states. I see the randomness controlled by the motions of the human body, depicting a trail of motion that gives further context to their movements. I also agree with the success of the artists to give life to this piece, purely made of basic, unnatural geometries. Through the randomness, I can see a human. Their success in beautifully depicting motion gives the audience enough to see a normal person carrying out the movement. 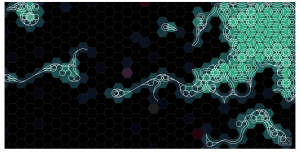 The project that my peer and I have chosen to talk about is the Hexagonal Generative Game of Life by Charlotte Dann. I think the cited project is definitely one of the more interesting and mesmerizing generative art project that I have seen. I could just picture myself staring at the animation due to how much variation there is and how smooth and organic the movement is. I completely agree with my peer’s assessment and I think my peer’s assessment gives a very good and summative explanation of the project, and also explains very clearly what she thought was impressive about the project. I think Charlotte, the creator of this project is very honest on her progress, and explained what worked and what didn’t. I especially how she explain a very simple algorithm, where the “ant” just decides on one of two direction, could create such interesting and intricate systems and diagrams. Below is the link to her entire project and my peers evaluation. This project is awesome, like Hae Wan mentioned, because it is a combination of digital processes informing a handcrafted, physical output. One thing I would like to add to the commentary is that coding is also a craft. It’s neat to think about the processes that make up each piece. With coding, the interaction with the computer is minimal and restricted to slight hand/finger movements. The print process affords many rich interaction because the tools require fully body control. But this does not mean that one cannot inform the other. The posters by Watz and Thorp are generative examples of pseudo-random algorithms that “simulate” nature. The simulation im taking about is that many of the patterns people see in nature have an element of randomness: rain drops, sand, etc. The contrast between the clear artificial form of the surfaces, made up by the random lines is fascinating! I enjoyed reading this blog post and learning about how artists are implementing their interactive, non-gallery work in public settings. I think that the gesture of flipping the plates in relation to the movement of water and downward movement of the eye is very clever. It creates the illusion of the fountain while also allowing more innovative room for the shape of the fountain, the movement of the water, the scale and closeness of the viewer to the work, and the interaction which initiates a change in the piece. I think especially with our most previous project, this work is relevant to expanding beyond the combination of code with two-dimensional visuals. 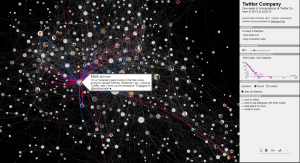 I found Hamza’s week 7 post about Santiago Ortiz’s (from Moebio Labs) visualization of Twitter connections. I agree with Hamza and Ortiz’s opinions that “data visualization is most effective not in the form of static charts and graphs, but as fluid, moving pieces of art”. There are certain types of information that should be visualized in a bar chart or pie chart, but when it comes to trying to visualize connections between subjects, it cannot be done in a numerical way. What’s interesting about the web about conversations between people at twitter is the fact that you can kind of imagine the personalities of people and the type of people they converse with. This may be because of common interests. Hovering over the circles with the person’s photo will show a blurb about the person. The BikeCycle project as well as many of Nick Felton’s other projects such as the Annual Report, are remarkable well designed from a graphic standpoint, but are also very intriguing in his ability to map these somewhat static datasets into more dynamic domains. I think Ryu does a great job in understanding the nature of Nick Felton’s project. I’m very interested in where the world of data visualization can take us; it is an exciting concept. For this Weeks Looking Outwards, I am going to be looking at Scott Snibbe who is an Interactive Media Artist, researcher, and an entrepreneur. He is one of the First who works with projector based interactivity wall. According to Scott Snibbes Website project ” Cause and Effect ” (2004) records viewers’ movements in silhouette as they simultaneously displace the recordings of previous viewers. When the movies re-play on sliding tiles, only the viewers’ movements are shown, giving a sense of autonomy to actions that were actually determined through interaction with the prior recordings. “Cause and effect” is a common translation for the Buddhist term Karma, which dictates that all human experiences, however minute, are the result of their own prior actions. Since we have worked with projection and looked at artist that uses silhouette in Children’s museum, I think it was really interesting who originally used this type of method. 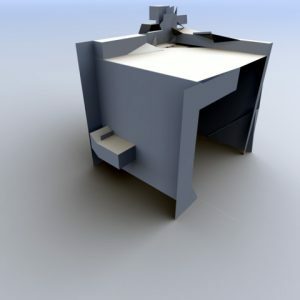 As a student in architecture, I do find this project (Alex Dragulescu) very intriguing. It fascinates me how spatial qualities can be so easily generated through computation. However, although the image on Ryu’s post is very picturesque and beautiful, it seems, in my opinion, that half of the mass is not spatial. Nonetheless, I find the project very interesting. 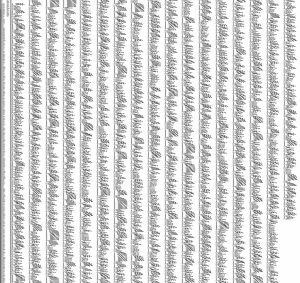 It is very interesting how so many different shapes could be created through, quoted from Ryu, “bothersome digital flotsam”, also known as spam mail.